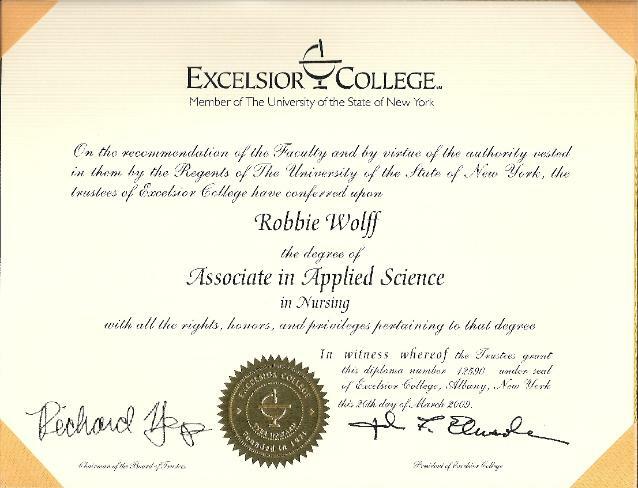 My name is Robbie Wolff and on April 6th 2008 I completed the CPNE with NO REPEATS. This was a stark contrast to my first CPNE where I did not even pass ONE patient care situation (PCS). The reason I did not pass even one, was because I had not PRACTICED the Excelsior way. Even if you have been a nurse for 30 years in an acute care setting, or someone like me who had NO patient contact at work, you need to do the Excelsior college critical elements in each area of care perfectly or you will FAIL!... and it's the reason you need MNEMONICS with a SYSTEM! It doesn't matter what Excelsior CPNE test site you go to... I have a system that will show you EXACTLY how to prepare AND PASS this test (just like its showed THOUSANDS of others).